Professionals often work on editing projects that possess only one file and they don’t have any associated EDL or project. If you are working from a remote location where you cannot upload gigabytes of files to clients or you just need to update the recently conformed reel pr spot then this single file editing task may appear much easier and useful. Step 1: First of all you have to import your video clip. Step 2: Use Scene detection feature to detect all the cuts at once. Step 3: You can edit as well as enhance your video for every minute. Step 4: Finally save your project and you can also share your creation on social media platforms. How to Enable Scene Cut Detection in DaVinci Resolve? Step 1: Go to the media page and then use storage browser to select your desired clip that you wish to divide into small chunks. Note that the scene detection feature is applied prior to clip importing. Step 2: Right click on file and select scene cut detection function. The new window will immediately get opened with your selected clip. The scene detect window is having three different sections: Cut List, Graph and Viewers. These advanced controls help users to analyse their movie while examining the automatically observed cut points. Users can also maintain their cut list over here. It contains three viewers that can be used to gain information about whether scene detect graph is on right cut point or not. Note that the leftmost viewer shows information about last outgoing frame from a detected cut point, the centre viewer represents first incoming frame of cut point and right most viewer will help you to see second incoming frame for that particular cut point. You will find the scene detect graph on left bottom half of this window, which shows the analysis result of scene detect after clicking the Start button. It is available at lower right side of the scene detect window and displays one entry of every scene that is intersecting confidence bar. How to Use Scene Detect? Here you will find the ideal workflow for scene detection without ELD. Step 1: Use Media Storage Browser form Media page to locate your media file. Step 2: In case if it is using drop frame type time code then you need to verify the frame rate. Access “Drop frame timecode” parameters from master project settings. Step 3: Right click over media file and from drop down menu select Scene cut detection. Step 4: Your Scene detect window will appear on screen where you need to hit the Options menu and select Auto Cue feature. Finally hit Auto Scene Detect option. DVR will immediately locate cuts within pieces. Step 5: Once scene detection process is finished then you can move your playhead to shorter scene cuts and gain information about actual cuts from viewer windows. Note that, if frames are displayed as “different-same-same”, it means you are at genuine cut and in case if it displays “same-same-same” then it is not the real cut. You can find the editing task results in the upper right part of screen where pre edit point frame as well as two post edit point frames are displayed. It will help you to evaluate your cutting process for better results. Never forget to check those shorter vertical lines on tolerance bar to gain right effect. Step 6: In case if you find numerous low cost type cuts that are actually not the genuine cuts then it is good to drag magenta confidence bar. It will help to hide all those low cost cuts from footage. After this analysis, you will find many lines on timeline and these lines will reflect the confidence of Resolve for detection of cuts. The purple line on interface is named as tolerance bar; the lines above this point are included whereas lines below this point are excluded from processing. Step 7: It is time to move down your cut list and it can be done by making evaluation for each scene. Hit the very first scene from list and then use down arrow from keyboard to select next cut from list. Up arrow will help you to move to previous item in the list. If you want to remove any scene cut from clip then use Minus button from bottom left corner of screen. Step 8: In case if there are so many sections on scene detect graph and they have dense spike groups then it can create confusion for scene cut detector tool. If you want to remove this undesired noise then use In/Out buttons for isolation and finally hit Prune to get rid of those scenes. There are chances that Resolve will misinterpret cuts from camera flashes, in that case you need to use add or delete buttons to create or remove edits. The whole section of unwanted edit points can be removed from IN/Out point settings and then hit Prune Button. Step 9: If you find undesired gap between two cuts of scene then scrub playahead feature can be used to find missing cut from footage. Use add button to add new cut at desired location. 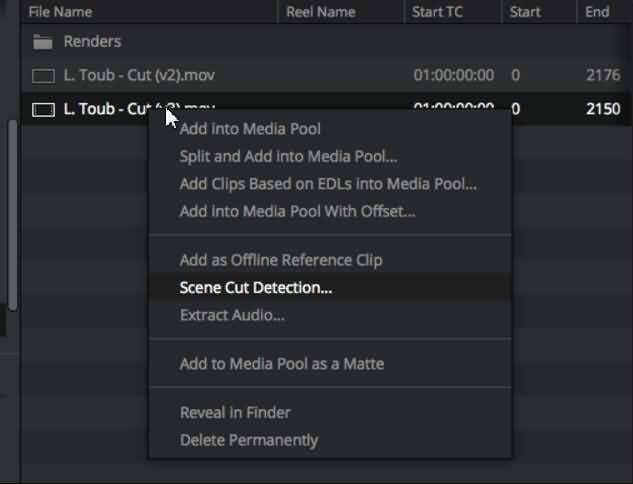 Step 10: Once you become confident about your Cut List then split your media file into various small clips using Add Cuts to Media Pool option. Step 11: The conform settings dialogue box will soon appear on screen; hit okay if you have verified all settings in 2nd step. Step 12: Close your Scene Detect Window and the small clips can now be analysed in media pool. 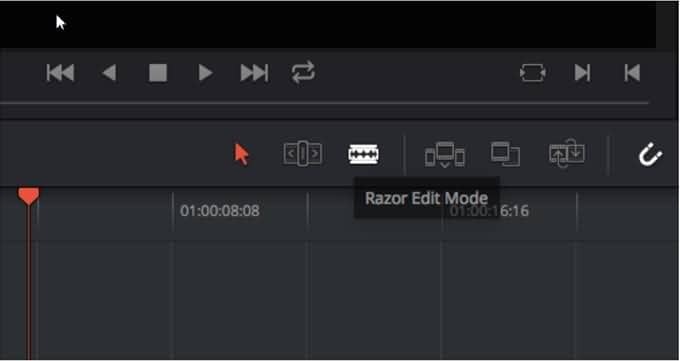 In case if you feel that any scene is missing from footage then simply navigate towards edit page and access Razor Edit Mode for separation of clips into two different sections.